Facebook has launched Facebook Messenger ads, a fast, new way for customers to communicate with businesses in Facebook Messenger. Previously, one-to-one conversations between businesses and their customers on Facebook could only be initiated by the customer clicking the link on the business's Facebook page. The old way required the customer to have specific, focused intent. The customer had to know exactly what they wanted to ask/say to the business directly, and they had to go through several decided clicks to do so, and the customer would have needed to write the opening message, explaining their needs or concerns. Small businesses may not often have such highly-motivated customers. Facebook Messenger ads can help small businesses communicate and stay connected with customers through every stage of the conversion funnel. Now, messages with businesses can be started by clicking links in News Feed ads. These ads in the News Feed which open Messenger conversations are being called Facebook Messenger destination ads. Facebook Messenger Destination Ads Distractions come up and people forget to reach out when they mean to. Messenger destination ads are a great way for businesses to poke their head in on the customer, like a restaurant server, coming back to check up on a table: “Hey! I know you’ll flag me down if you need anything, but I’m here right now, do you need anything?” Just imagine Facebook Messenger ad placement as the restaurant (the venue of the interaction), your brand as the waiter (providing proactive service, anticipating customer needs and concerns), and naturally, your customers and prospects are the diners. Another new option with the introduction of Facebook ads to Messenger is Facebook Messenger sponsored messages. The placement of the ad is in Messenger conversations. The ad is sent directly to the customer’s Messenger inbox and looks exactly like a message that the person would receive from any friend or Facebook user. With Facebook sponsored messages, businesses can now re-establish contact with people who have previously had Messenger conversations with the business. 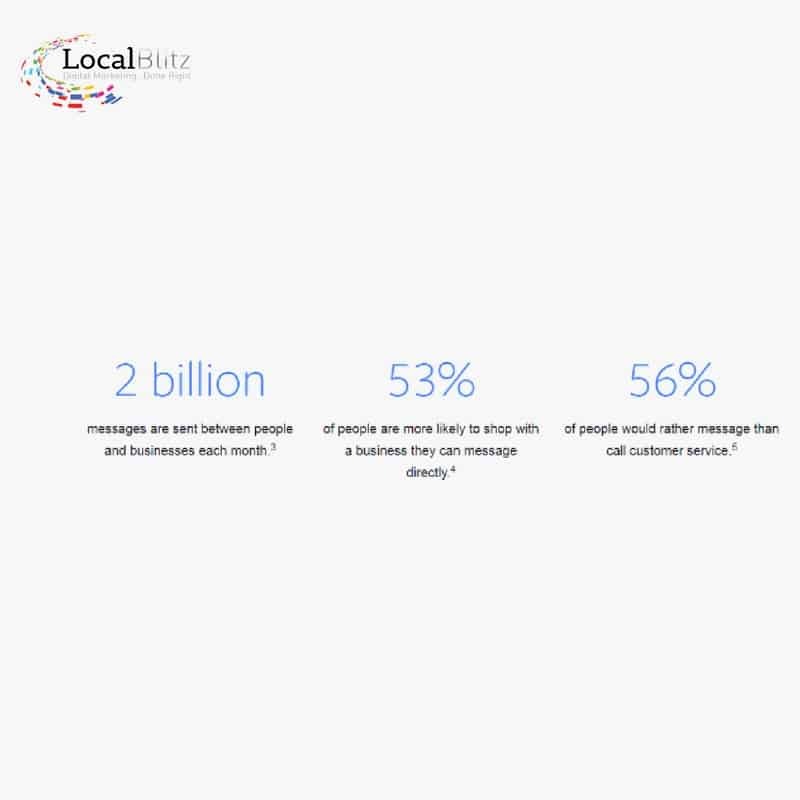 Simply put, once the customer opens the Messenger door, businesses can send sponsored messages to touch base. We want to think about this new opportunity strategically. 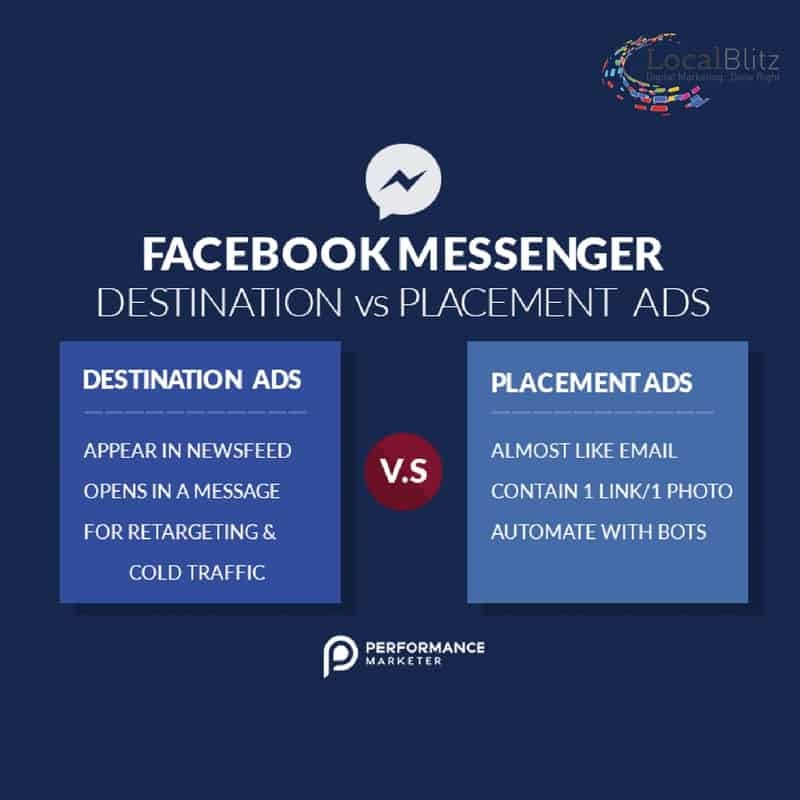 Facebook Messenger placement for ads gives trustworthy brands a way to link ads to messenger and to send follow up. Forms of Facebook Messenger Ads. To review: Facebook Messenger destination ads link ads to Messenger. They appear in the News Feed, and they open a Messenger conversation. Placement ads, or sponsored messages are messages sent from a brand page directly to a person’s Messenger inbox. 2. Use destination ads to offer a lead magnet to cold leads. If you know what a Lead Magnet is, great! If not, check it out, because offering a value-adding Lead Magnet is a great way to make a positive impression on cold traffic. Read more about them from Digital Marketer here. Targeting cold traffic as a small business often gets pushed to the side because it’s daunting. People who don’t know you usually tend to ignore you unless you have the right thing to catch their attention. Lead magnets have two great advantages to break the ice and make a good first impression: People love free things, and people hate hard-sells. If you have the right lead magnet, you can begin a mutually beneficial line of communication with prospects. 3. Use Messenger destination ads to offer a coupon or discount. Create a Messenger destination ad that will send the coupon or discount code to the customer’s Messenger inbox. The News Feed ad will link to Messenger, opening a conversation window with your brand. 4. Use Facebook Messenger placement ads to follow up with recent customers or recent bouncers. Suppose a customer clicked your Destination ad to get a coupon code, they went to your site and added an item to their cart, applied the discount, and never finalized the purchase. You can use a sponsored message to find out what got them stuck in the funnel, and to help them reach the end. Check in and ask for feedback or offer support for customers who have received their orders. You don’t have to personally reply to every Messenger contact. Free up your time by having a Facebook Messenger ad bot reply to frequently asked questions. It’s simpler than you think to set up, and there are many options for Facebook Messenger bots. Organize with tags like “Sales” “Troubleshooting” “Follow-up” “In Progress” or “Completed”. Understand the purpose and content of each conversation with a glance at your business’ Messenger inbox. 7. Use a unique Messenger destination ad link outside of Facebook You can create a unique link that opens a Facebook Messenger conversation, no matter where the link is clicked. Include it in an email newsletter, on the purchase page or post-purchase page of your website or purchase confirmation email.